Fun enough for the kids. Just grown up enough for the adult palate as well. So simple to make. Ready for it? Sure you are. This is a fun twist on macaroni and cheese. I like creating an opportunity to introduce children to new foods and expand their palates, while simultaneously eating something with a sense of familiarity. 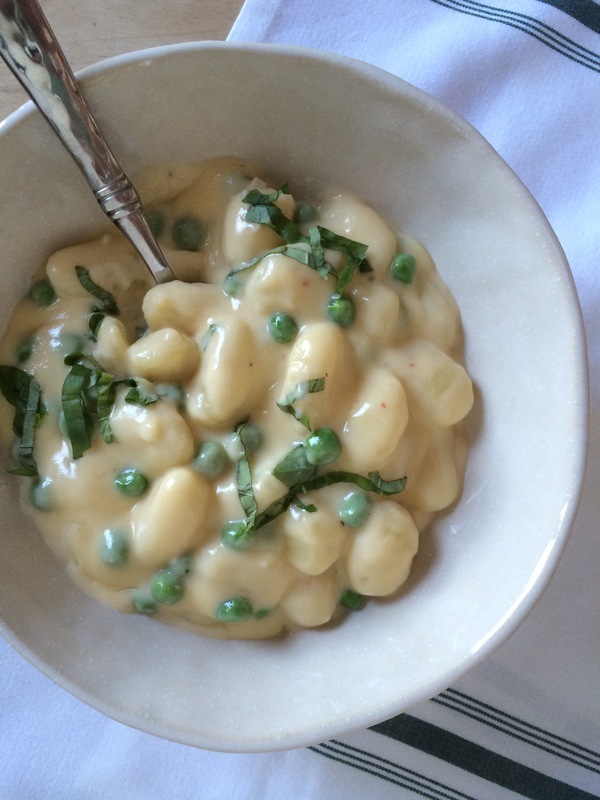 Stove-top Gnocchi (not Mac) and Cheese with Peas … does just that. It’s a rich, decadent cheese sauce. Move over kiddies, I’m diving in too. 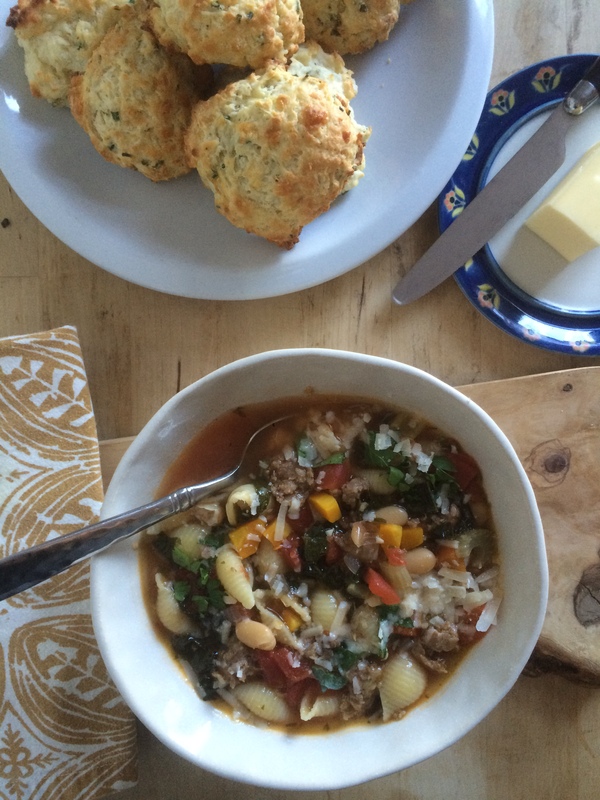 If you’ve never cooked gnocchi (small potato dumplings) before, the time is now. Your family will love these little potato pillows. Just bring a big pot of salted water to a boil (as you would for pasta). Then add the gnocchi, give it a stir, and wait until they rise to the surface. About 3-ish minutes. Once they’ve floated to the top, just strain out the water and you’re ready to go! Easy peasy! Prepare your ingredients ahead of time. 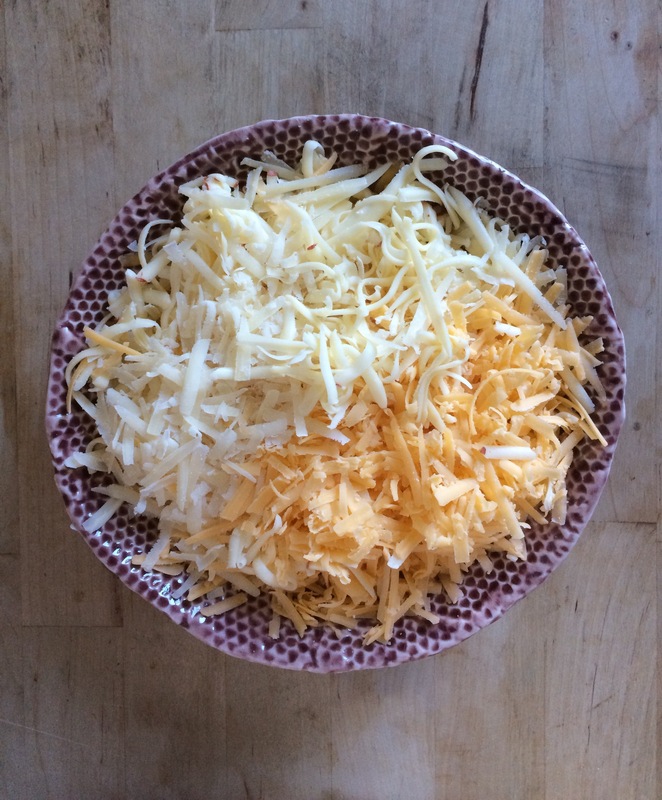 Shred your cheeses and have your milk and seasonings out and ready. The thing about cheese sauce is that things happen fast. Because you’re working with milk, butter, cheese and heat – this sauce can burn easily if you’re not careful. 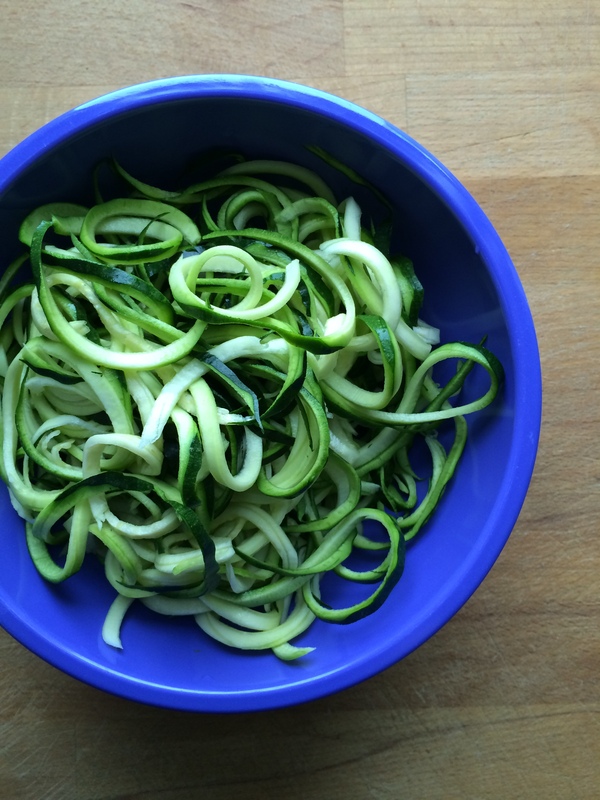 By getting everything prepared ahead of time, you can focus on the cooking. 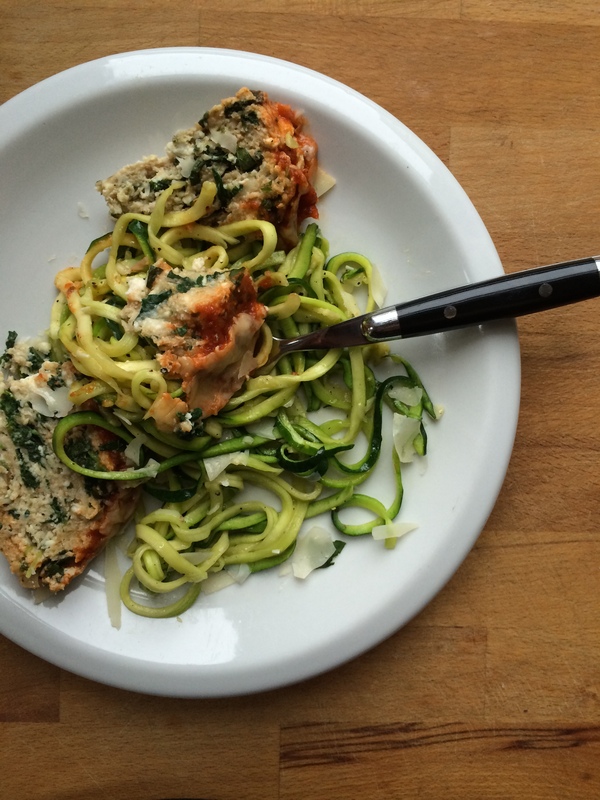 This dish comes together in under 30 minutes. Being prepared in one pot means minimal clean up. (We love that!) Happy family. Easy clean up. Delicious meal for the whole crew. Bring a large heavy-bottomed stock pot of salted water to a boil. Add the gnocchi and cook according to package directions. Drain, set aside, and reserve. Make sure to toss the cooked gnocchi frequently so they do not stick together when preparing the cheese sauce. Next, make the béchamel sauce. In the same pot, melt the butter over medium-low heat. Once the butter has melted, add the garlic and cook for 1 minute. Stir in the flour and cook the mixture, stirring constantly until light brown in color with a slightly toasted aroma, about 3 minutes. Add the milk slowly into the flour and butter mixture, whisking constantly so you get all the lumps out. Bring sauce to a low boil, whisking constantly, then simmer, still whisking occasionally, for 3 minutes to thicken. The sauce should thicken enough to coat the back of a spoon. Stir in cheeses, mustard powder, salt and pepper until smooth. Note: Do not add your cheese too fast or too soon as this could result in clumpy, greasy chaos instead of creamy, cheesy deliciousness. Instead, wait for your béchamel to reach the right thickness. 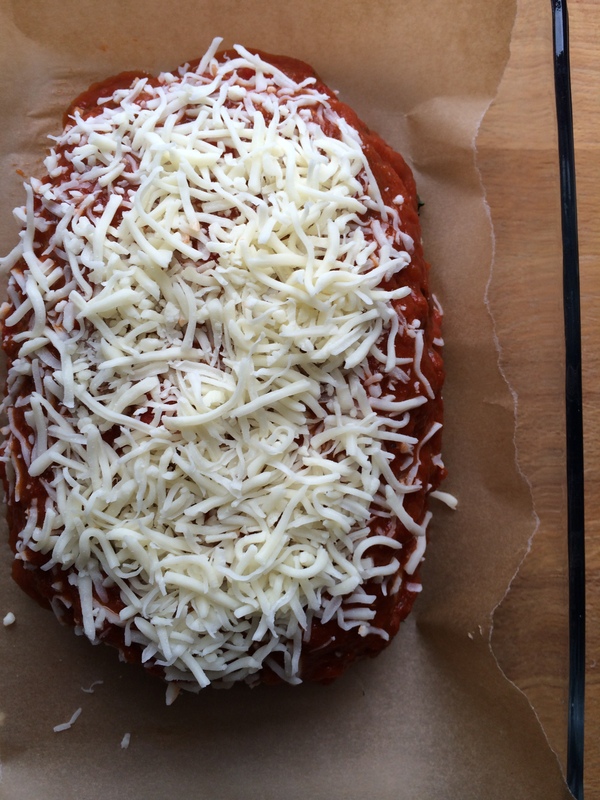 Then, add the cheese in three batches, making sure each batch is completely melted before adding more cheese. 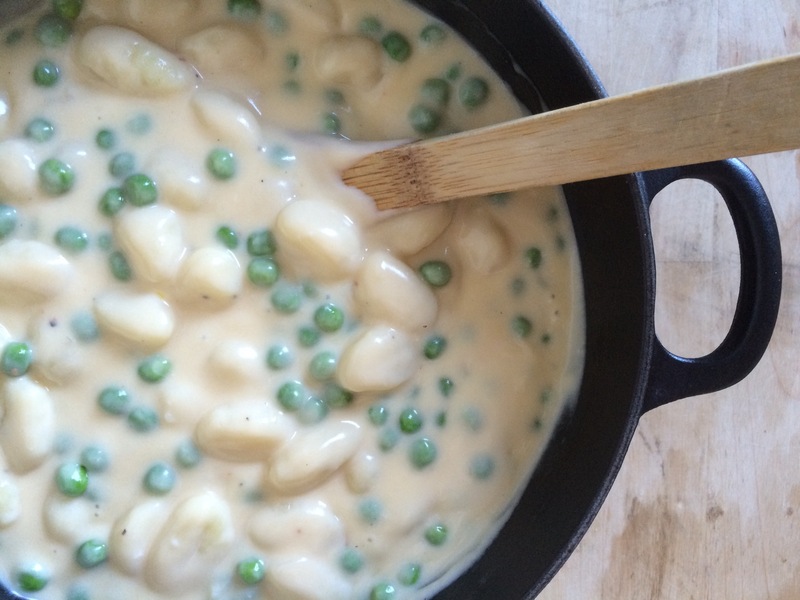 Add the gnocchi and peas, stirring to combine, and cook over low heat just until warmed throughout. 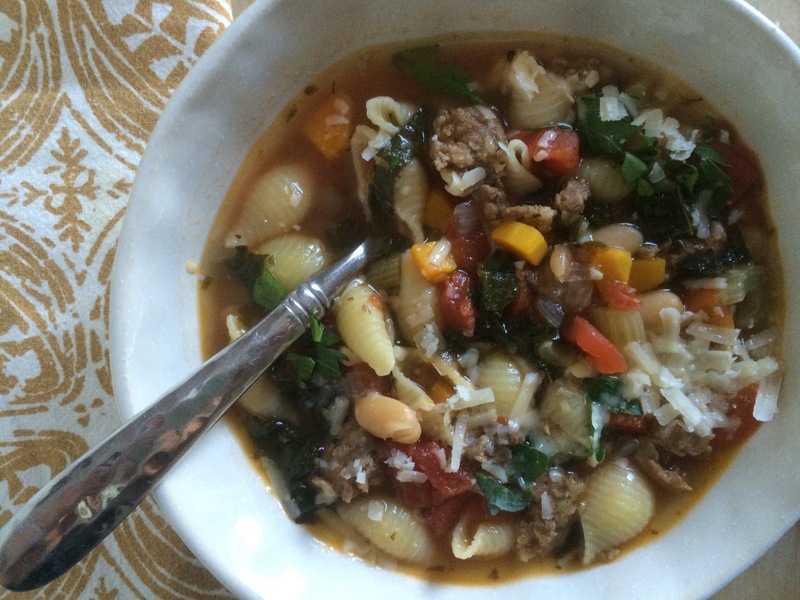 Serve immediately with fresh basil and additional parmesan cheese. Note: It will originally seem that there is too much cheese sauce for the amount of gnocchi. 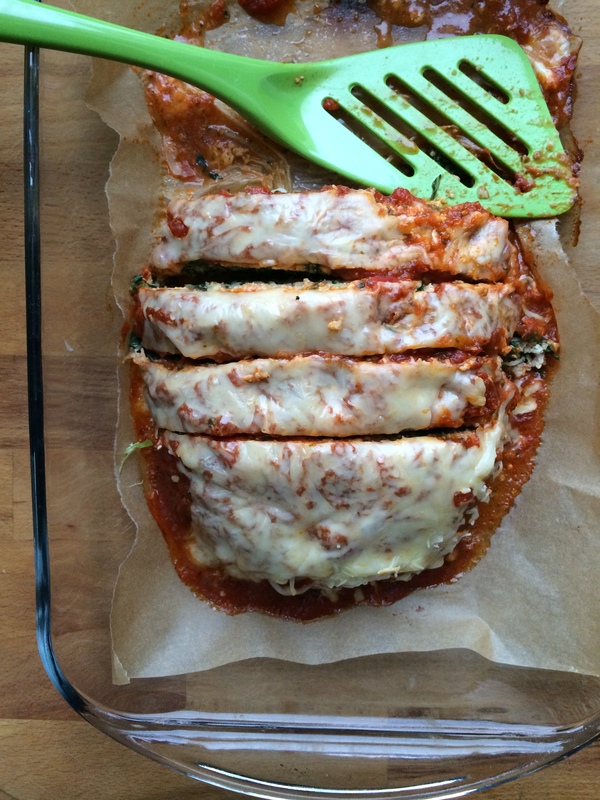 Trust me – the sauce will continue to thicken and you will be happy with the extra creamy, cheesy deliciousness. Note: Leftovers can be topped with homemade breadcrumbs (2-3 slices of day old bread pulsed in a food processor to form small crumbs then combined with 1 tbsp melted butter and 2 tsp fresh herbs) and baked in a 350 degree F oven for 40 minutes until bubbling and golden brown. 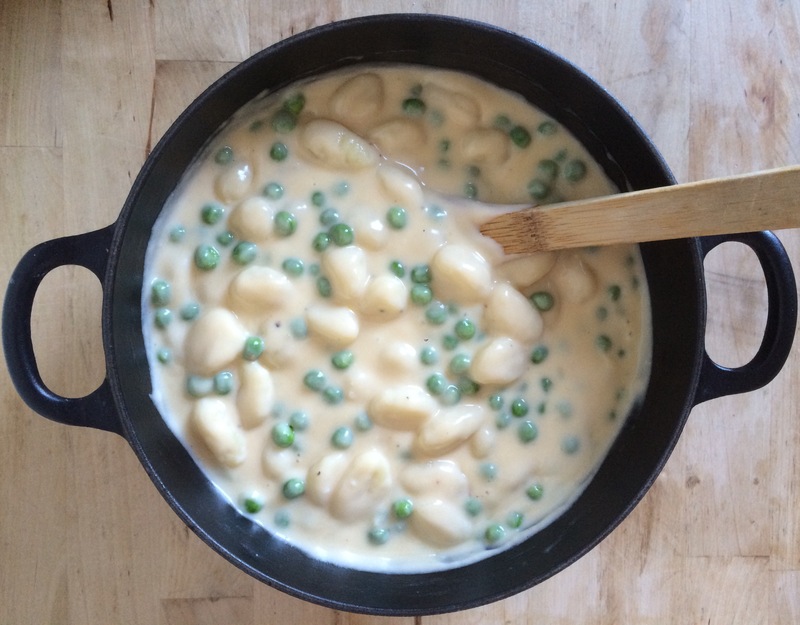 Thank you Bell Family Company for featuring Stove-top Gnocchi (not Mac) and Cheese with Peas on your blog. Anyone living in the New York or Chicago area looking for an incredible nanny service, look no further. Need a sitter for date night? A TravelSitter for your summer vacation? A full-time nanny for a new baby? They have you covered. Visit their website for details. Let them know Emily Always Cooks sent you! Time to talk lamb shanks? Why, yes. Yes it is. From the lower section of the leg, lamb shanks are a full-flavored cut of meat. They do, however, require a bit of love and attention to bring out their full potential. These shanks are first browned in veg oil. This gives them color while enhancing their rich flavor. Then, the’re slowly braised in a flavorful and aromatic liquid. This braising method breaks down the connective tissue and … (culinary cliche alert) … yields fall-off-the-bone tenderness. Now, let’s talk about the hot tub for the shanks. Or, the “baaaa-th tub.” (I couldn’t resist). All feeble-minded lamb jokes aside, I’m referring to the braising liquid. Onion, carrots, celery, garlic, and tomato paste are caramelized in the drippings from the browning process. They’re then combined with red wine, chopped tomatoes, beef stock, thyme, rosemary, and bay leaves. THEN … brought to a boil. The shanks are returned to the pot (tub) and placed into the oven. Three hours later, it’s feast time. 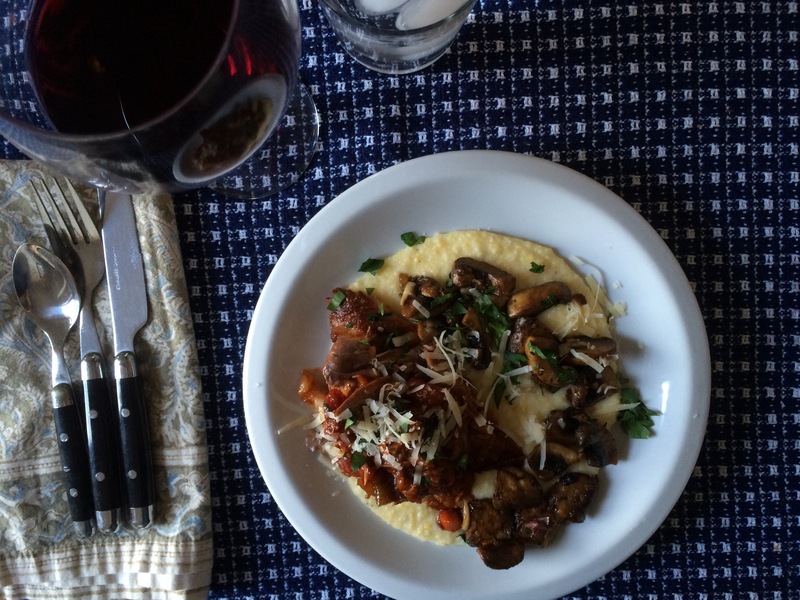 I paired these lamb shanks with dreamy Parmesan polenta and mushrooms. Glamorous! 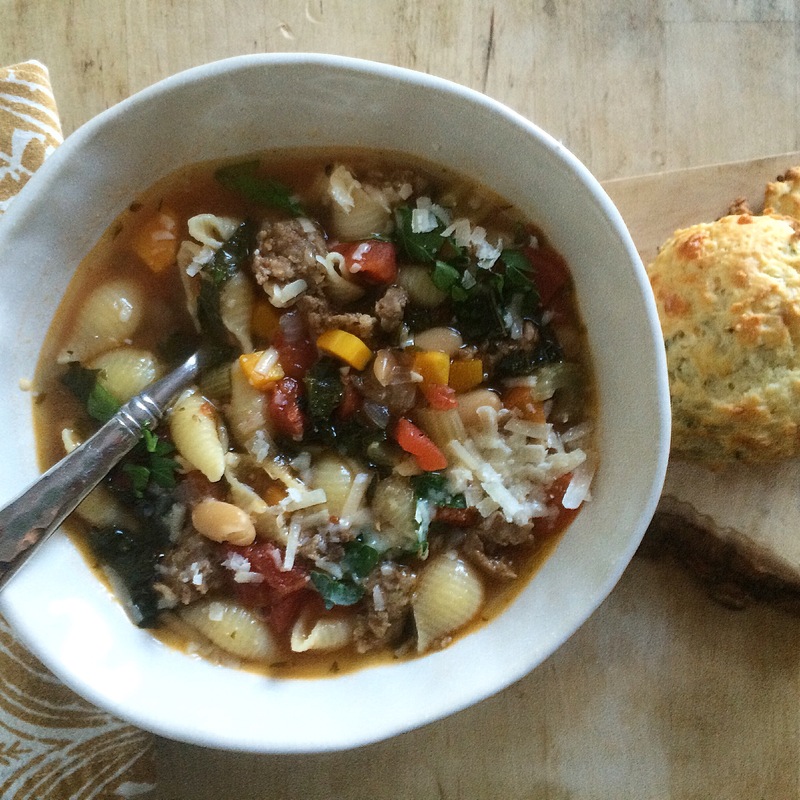 Make plenty, as leftovers can be transformed into another meal that shines. 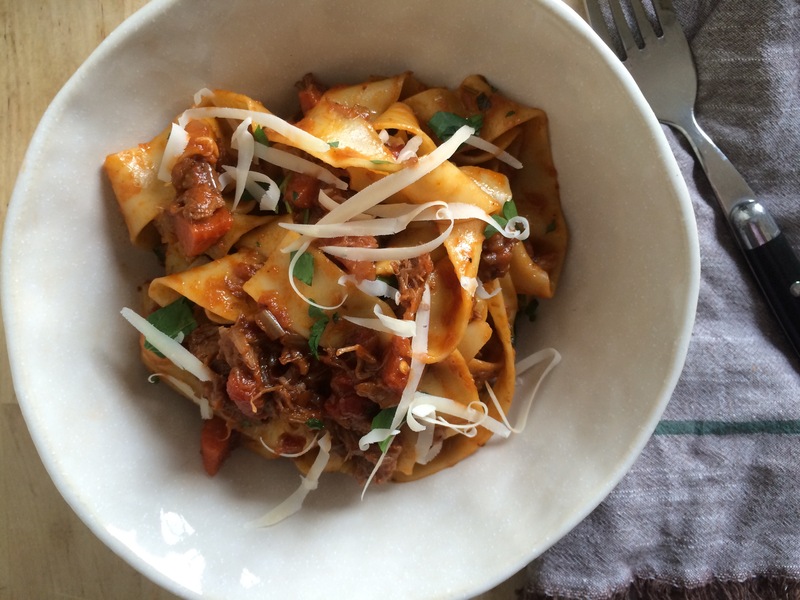 Shred left over lamb , combine with leftover sauce, and serve over pappradelle noodles with fresh basil and Parmesan cheese. 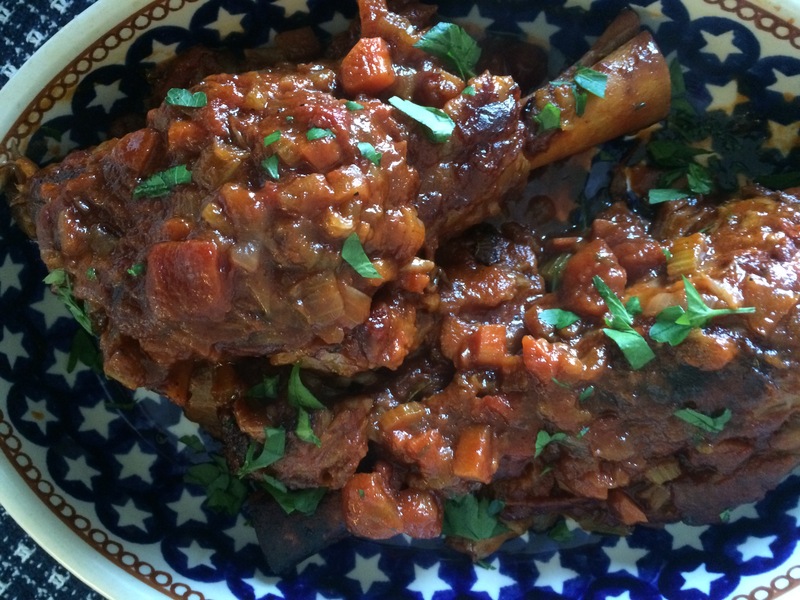 Allow lamb shanks to come to room temperature for 30 minutes. Trim off any excess fat, cut an inch off the end to expose the bone marrow, and season liberally with salt and pepper. Heat large dutch oven over medium-high heat. Add vegetable oil and sear lamb shanks on all sides until nicely browned. Remove lamb shanks and set aside. Drain excess fat from the dutch oven, leaving about 1/2 tbsp. Drop heat to medium and add carrot, celery, and onion. Cook for 15 minutes until vegetables are nicely caramelized. Add a pinch of salt and freshly cracked black pepper to season. Add garlic and cook for 2 additional minutes. Add tomato paste and stir into vegetables to coat. Cook, stirring often, for 8-10 minutes to caramelize and develop the tomato flavor. This is an important step. Don’t skimp on caramelizing the tomato paste as it adds a lovely depth of flavor to the dish. Place lid on dutch oven and put in the preheated oven and cook for 2 1/2 hours, basting and rotating lamb shanks 2-3 times throughout the cooking process. Remove lid and cook an additional 30 minutes to concentrate the cooking liquid. 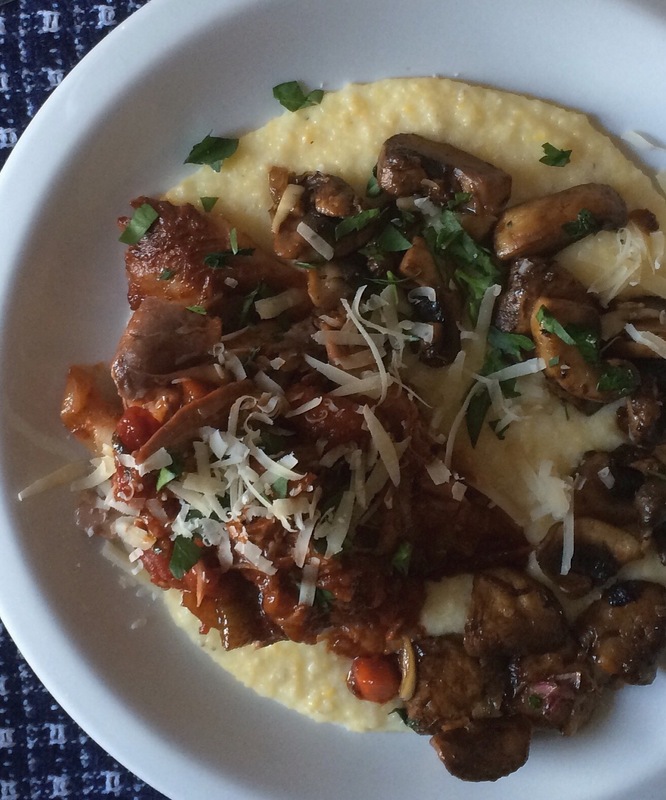 At this point, start your parmesan polenta and mushrooms. Remove lamb shanks to a serving platter and tent with foil to keep warm. Place the dutch oven on the stove-top over low heat. Remove thyme bundle and bay leaves, and skim off any grease that has gathered on the surface (I removed about 3 tbsp). Taste sauce and season with salt and pepper if necessary. Add 1/4 cup fresh parsley. Spoon about 2 cups of sauce over lamb shanks and serve with parmesan polenta and mushrooms. You can serve the lamb shanks 2 ways – remove excess fat from the shanks, discard, and serve chunks of lamb mixed with the sauce (like a ragu). OR -serve each person an entire lamb shank to pick at themselves. Both ways are equally as good 🙂 ALWAYS serve with parmesan polenta and mushrooms. 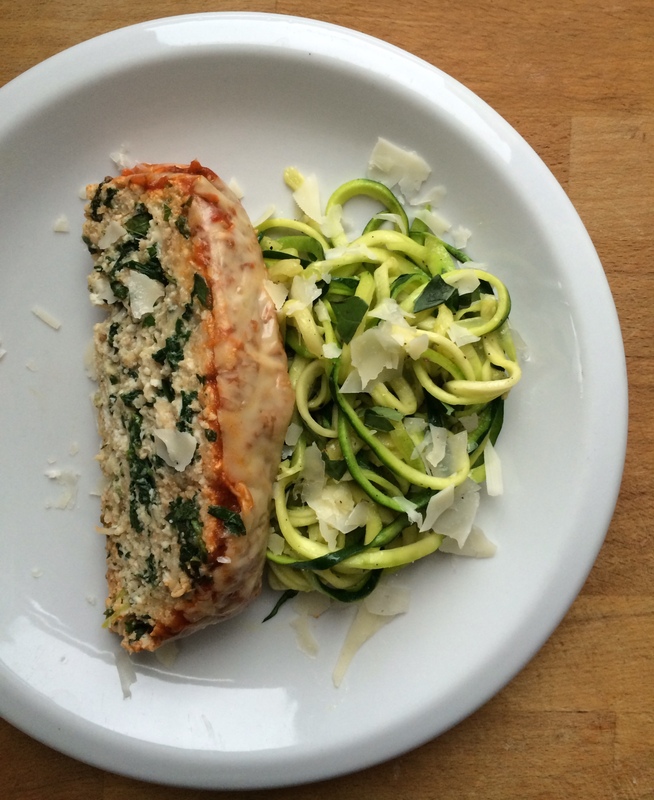 Top plated dish with freshly grated Parmesan cheese and fresh parsley. Note: If you are serving a crowd, there will be enough sauce for 4-6 lamb shanks – no need to double the sauce if you cook additional lamb shanks. Just make sure your dutch oven is large enough, or cook in 2 pots. 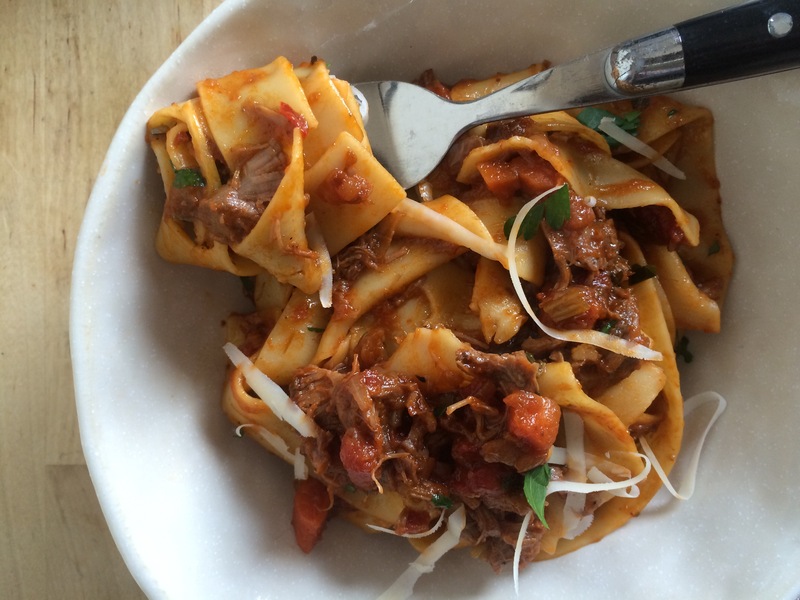 Leftovers: Shred left over lamb shanks, combine with leftover sauce, and serve over pappradelle noodles with fresh basil and Parmesan cheese. Food tastes better when eaten outdoors. That’s just a universally known scientific fact. 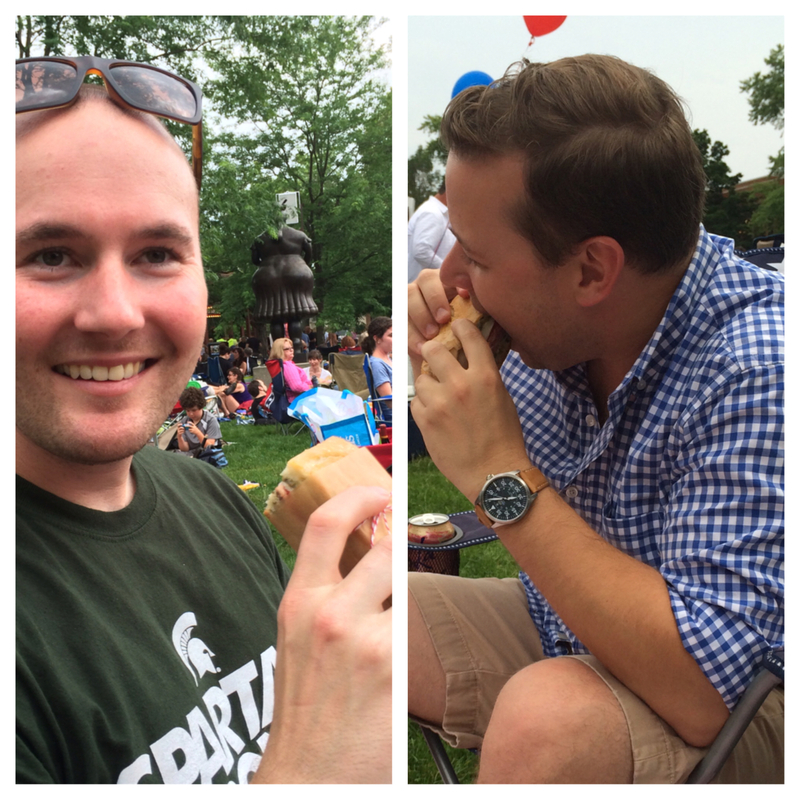 Some of my fondest memories have involved food being enjoyed outdoors. Whether gathered around my dad’s grill listening to the sizzle of his famous chicken or ribs, twirling spaghetti on the patio of my favorite restaurant, or the simple pleasure of a homemade sandwich and a glass of wine on a blanket in the park. 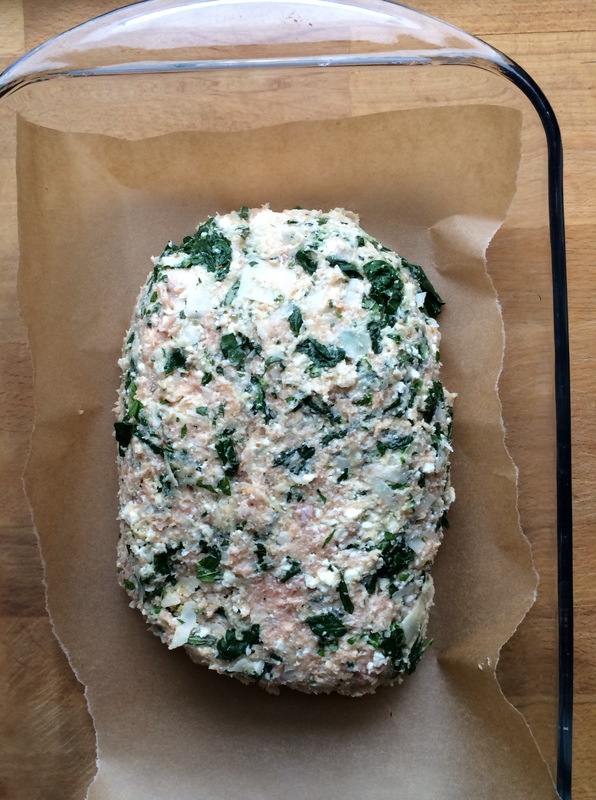 This beautiful sandwich is absurdly easy to make. 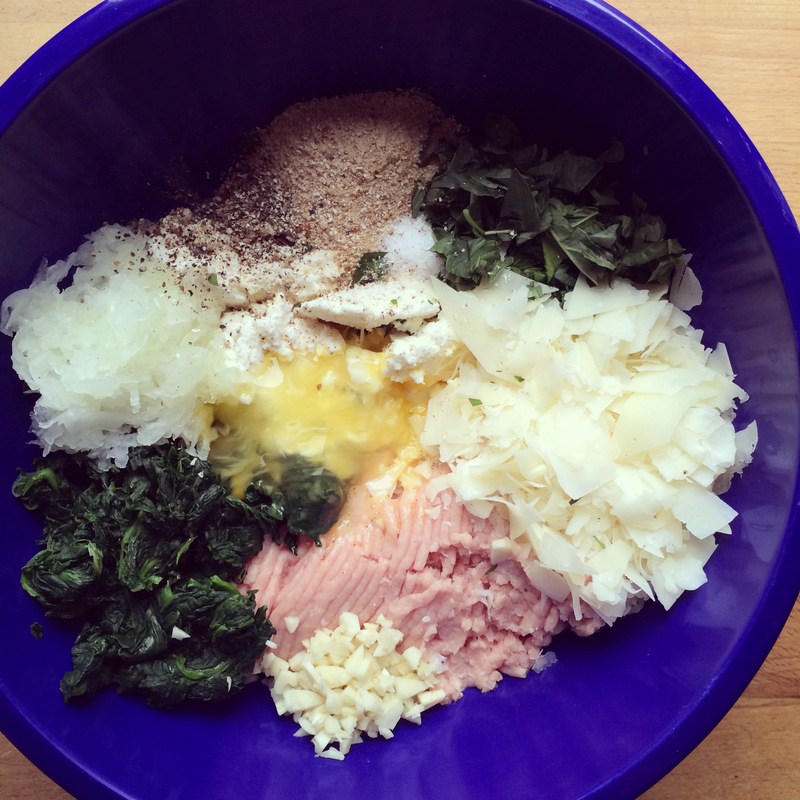 Simple assembly of high-quality ingredients is the name of the game. No cooking required. Start with a fresh loaf of ciabatta bread. Ciabatta is crusty on the outside, and soft and pillowey on the inside. A great sandwich bread. 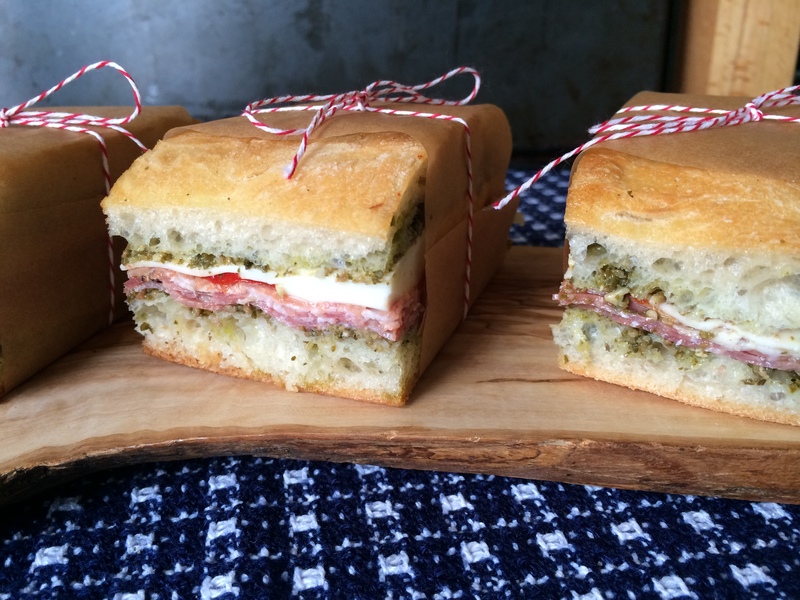 Cut the ciabatta in half horizontally and slather both sides with homemade pesto. Next, layer on salami, soppressata, prosciutto, roasted red peppers, mozzarella cheese, provolone cheese, asiago cheese, and fresh basil leaves. Turning this delicious sandwich into a delicious PRESSED sandwich involves wrapping the whole loaf tightly with plastic wrap, and then weighing it down in the refrigerator overnight. 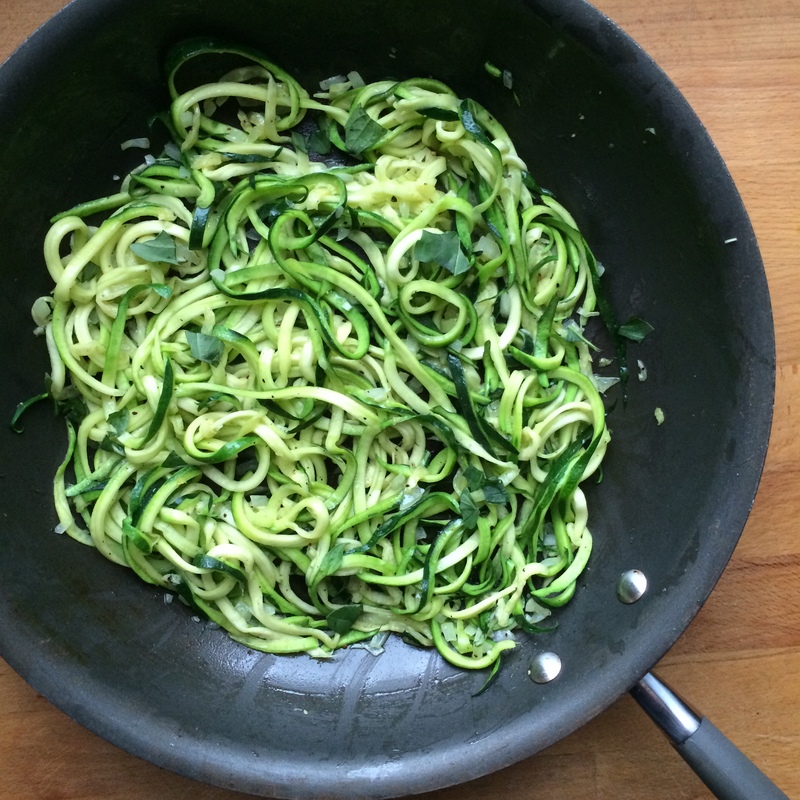 This compresses all the ingredients together and infuses the flavors. The next day, trim the edges, wrap in parchment paper, and tie with a cute string (don’t ever skip that last step). 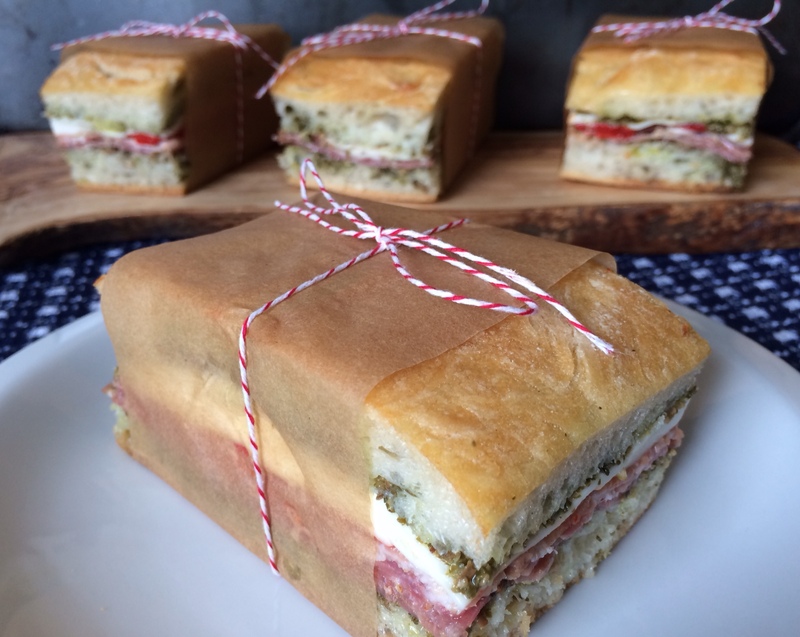 You now have a gorgeous, scrumptious, perfectly mess-free picnic/outdoor sandwich. Fond food memories await. *My slices were very large, if you are using smaller slices, double the amount. Directions: Slather pesto on both sides of the bread. Lightly coat the bottom half to prevent the bread from becoming soggy. Using the bottom half as the base, build the sandwich by layering salami, soppressata, prosciutto, roasted red peppers, fresh mozzarella, provolone cheese, asiago cheese, and fresh basil leaves. 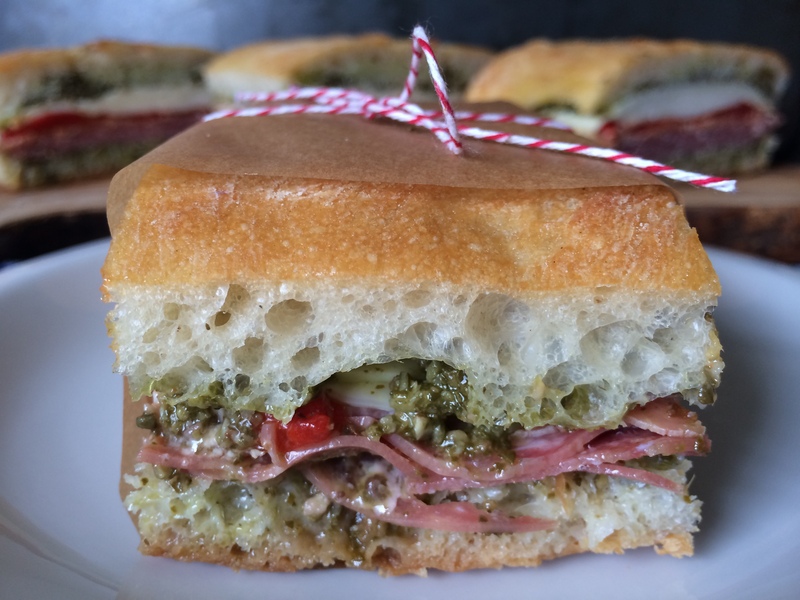 Top the sandwich with the upper half of the ciabatta. Tightly wrap the sandwich in saran wrap. Place on a tray large enough to hold the sandwich, (I used a cookie sheet). Place cookie sheet in the refrigerator and weigh it town with a heavy object. I used a large cast iron grill pan topped with a dutch oven. Allow sandwich to compress overnight. The following day, remove sandwich from the refrigerator and cut off about 1/2 inch of sandwich from all sides. I cut the edges while the sandwich was still wrapped in the saran wrap. This kept the sandwich together while cutting. Cut whole sandwich into 4 separate/evenly sized large sandwiches, or 8 small sandwiches. 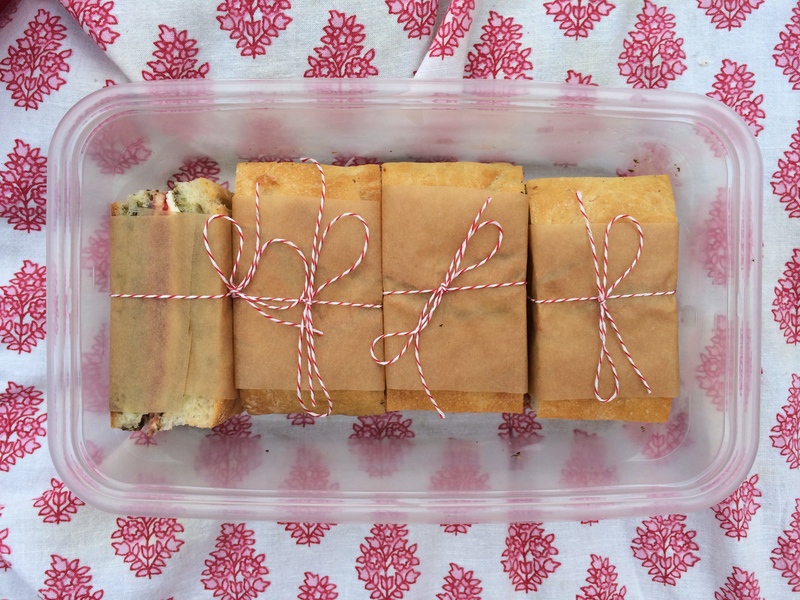 Wrap in parchment paper, and tie with a cute string. Refrigerate until you are ready to pack up your picnic or serve the sandwiches.